Who had the best tan? 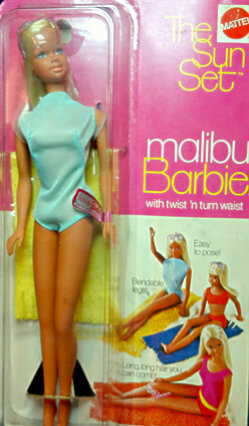 Well of couse it's "the #1070 Sun Set Malibu Barbie"! She had beautiful long blonde hair with lavender sunglasses on top her head. Mattel used the Stacey head mold on this girl. The "Malibu" dolls were an instant hit. 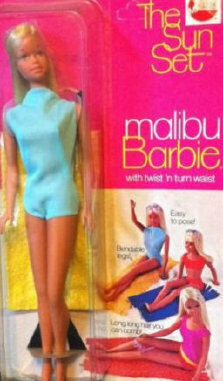 So popular, that Mattel added Malibu friends and family soon after. By 1973 she no longer had the Japan Marking, she was now made in Taiwan. Later in 1974, her marking changed again to "made in Korea". Along with the doll, the packaging included an aqua one-piece swim-suit, lavender sunglasses, and a yellow towel. In 1975 she wore a rose colored swimsuit but no additional accessories. The dolls markings are as follows: 1971-1972 Version: Sun Set Malibu:©1966 Mattel, Inc./U.S. Pat. Pended/U.S. Pat. Pend./Made In/Japan, 1973 Version: 1966 Mattel, Inc. U.S. & Foreign Patented Other Pat's. Pending Made in Taiwan, 1974-1975 Version: 1966 Mattel, Inc. U.S. Patented/ U.S. Patented Pend/Made in Korea, 1976 Version: © 1966 Mattel, Inc. Made in Korea. In 1973 she was made in Taiwan and wore the same clothes as shown above. The 1974 dolls were made in Korea and still had the wrist tag, sunglasses, yellow towel, and wore the blue swim suit. This 1974 Korea doll is shown with her mail-order shipper box rather than a store box. From 1971-1974 the store box did not change. This doll had the Korea Marking and new color of swim suit. She did not have a towel, sunglasses or wrist tag. Shown above is the 1975 white box and next to it is the redesigned 1976 rose colored box with out the wording "The Sun Set". #1067 Sun Set Malibu packaging from 1971-1974. Late in 1974 these doll did not have a wrist tag anymore. #3269 Forget-Me-Not-Barbie - She was a promotional doll that was available from the Kellogg Company in 1972, but the packaging is marked 1971. She is the same doll as the 1067 Sun Set Malibu that's made in Japan.